Originally posted: June 5, 2018 . Last modified: March 30, 2019 . 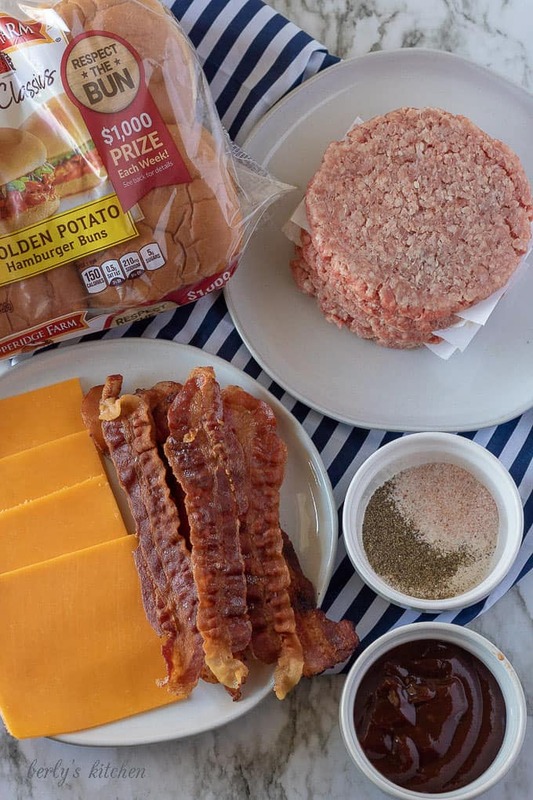 Ultimate BBQ Bacon Cheeseburgers will take center stage at your next barbecue. 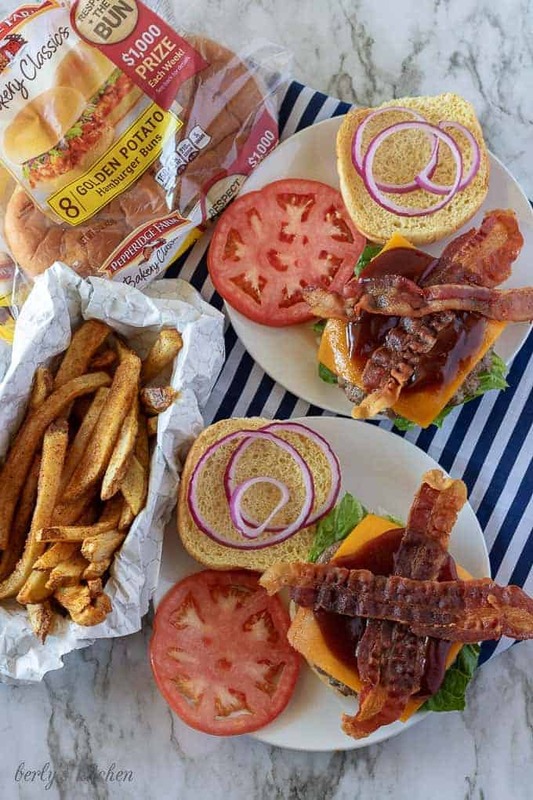 These bacon cheeseburgers start out with Pepperidge Farm® Hamburger Buns. Each patty is grilled to perfection then topped with all your favorite fixings like lettuce, tomato, purple onion, and cheese. We made this burger the ultimate by adding crispy bacon and a sweet barbecue sauce. BBQ Bacon Cheeseburgers will easily become a family favorite! Grilling is something we’ve enjoyed doing for as long as I can remember. Back when we lived in a house, we were able to have a propane and charcoal grill and used both frequently. 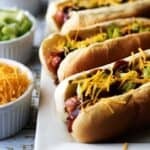 However, since moving around to different condos and apartments over the last ten years, grilling has been out of the question. Most apartment communities won’t allow grilling on the premises. That doesn’t mean we can’t enjoy an awesome bacon cheeseburger every once in a while. A stovetop griddle does a great job at mimicking an outdoor grill but with the convenience of indoor cooking. For the ultimate indulgence, try topping the burger with a little pulled pork! With the summer months fast approaching, we decided to start “grilling” more, and, of course, burgers were on the menu. Before busting out the handy griddle, we had to shop for the best ingredients. First is choosing the right bun. Any ol’ bun wasn’t going to work for these BBQ bacon cheeseburgers. We needed buns that would hold up to weight and all the toppings. 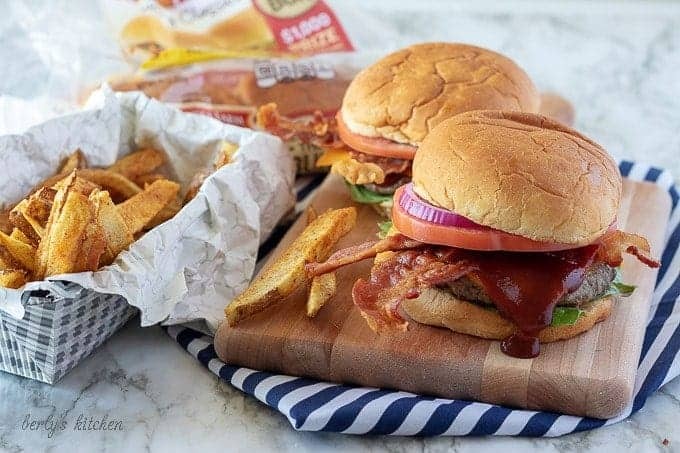 Pepperidge Farm® Hamburger Buns are made for these kinds of burgers. They’re soft, flavorful, yet hearty enough to hold up to all the ingredients. Next is the meat. We chose pre-made hamburger patties. Let’s face it, making hamburger patties by hand isn’t difficult, but when you want to save time, pre-made patties work great! Now it’s time to choose the toppings! This is the fun part because it gives you the opportunity to make the cheeseburger however you’d like. Some of our favorites are romaine lettuce, purple onion, thick-sliced tomato, and sliced cheddar cheese. Don’t forget the bacon!! Two pieces of crispy bacon turn this basic cheeseburger into a tasty bacon cheeseburger! Here’s where you can truly be unique. Choose your BBQ sauce! Do you prefer sweet or vinegar based? Maybe somewhere in between? Regardless of what you like, add your favorite, and you’ve got an ultimate BBQ bacon cheeseburger. A good burger starts with good ingredients. Not only do the meat and veggies need to fresh, but the bun has to be cheeseburger worthy. No one likes a soggy, thin hamburger bun. We like Pepperidge Farm® Hamburger Buns. There are so many flavors to choose from, but the potato is our favorite for these BBQ bacon cheeseburgers. Potato buns, not your thing. Check out the other flavors here (ooh link). Don’t press on the burgers as they cook. You’ll lose all those tasty juices and end up with a dry burger. Just let the meat cook, and don’t touch it unless it’s ready to be flipped. If you aren’t purchasing pre-made patties, be sure to season the meat. We like to season our hamburger meat with salt, pepper, onion powder, garlic powder, and a touch of Worchestire Sauce. For a juicier BBQ bacon cheeseburger, use a hamburger meat with a higher fat content. Meat that’s 80/20 works well. 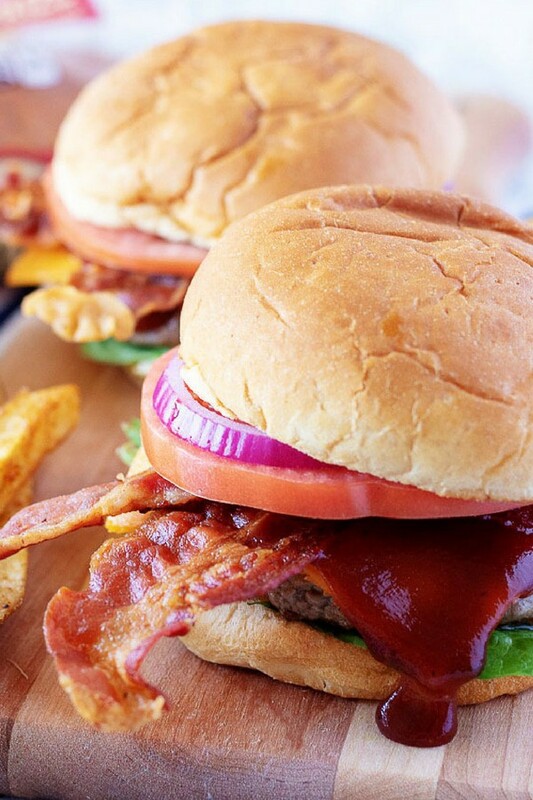 We hope that you enjoy these BBQ bacon cheeseburgers as much as we do. 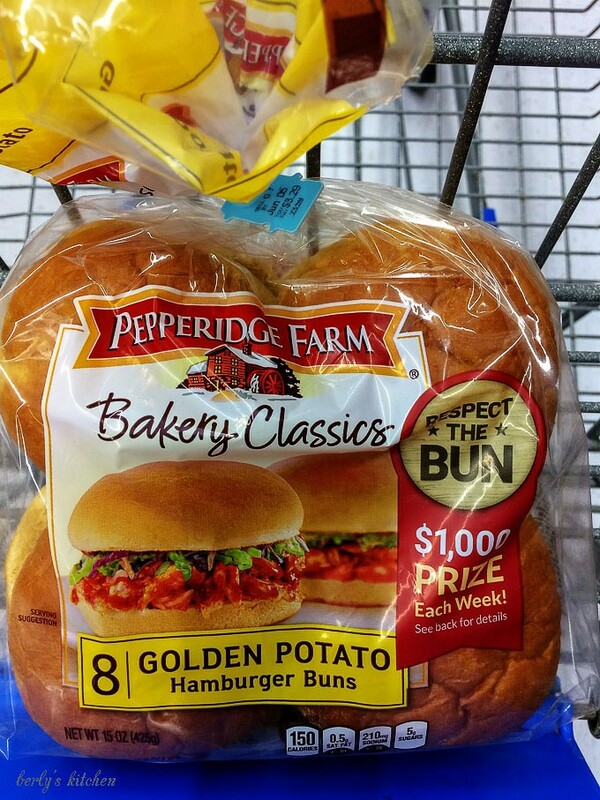 Be sure to give Pepperidge Farm® Hamburger Buns a try. They are a great match for these burgers. 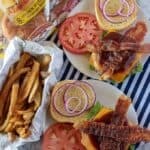 If you like this BBQ bacon cheeseburger recipe, please leave us a comment and rate the recipe card. You can also find us on Facebook, Pinterest, Twitter and Instagram searching for Berly’s Kitchen! 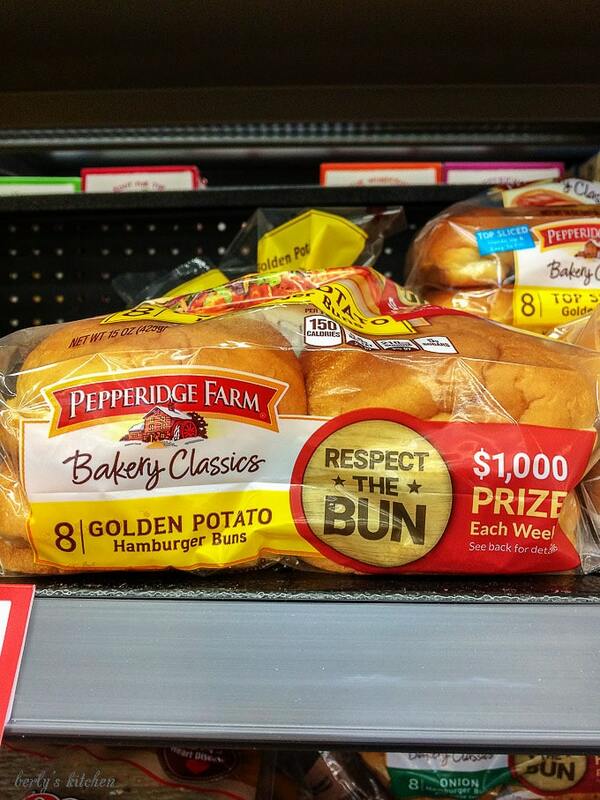 Don’t forget to check out Pepperidge Farm® Hamburger Buns and the #RespectTheBun campaign for your chance to enter and win! First, start by prepping all of your condiments, like tomatoes, pickles, onions, etc. Also, go ahead and cook your bacon strips and set them aside. Next, preheat your BBQ grill or indoor griddle and season your patties with the salt and pepper. Then, use your grill or griddle to toast the buns. After that, cook the beef patties for 4-6 minutes on each side depending on how you like your burgers cooked. Last, build the burger and top the beef with the cheddar cheese, bacon, BBQ sauce, and any other types of condiments you enjoy. The calories listed are an approximation based on the ingredients and a serving size of one complete burger. Actual calories will vary. Storage of these bacon cheeseburgers is not recommended. These look incredible! That BBQ sauce and the bacon, yum! I will need to try the potato buns! I love all the ingredients on the burger! The potato buns sound like a really nice change too. Thanks for sharing! Oh my goodness, it’s lunch time and I am drooling over these cheeseburgers, wishing that one would magically appear in front of me right now. I love when BBQ, cheese, and bacon are paired together on top of a burger. NOM. My mom was a big fan of potato bread, so that meant we were too! I love potato bread and especially love the buns!! 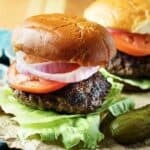 These burgers look fabulous with the sauce and the bacon! I can’t wait to try them! 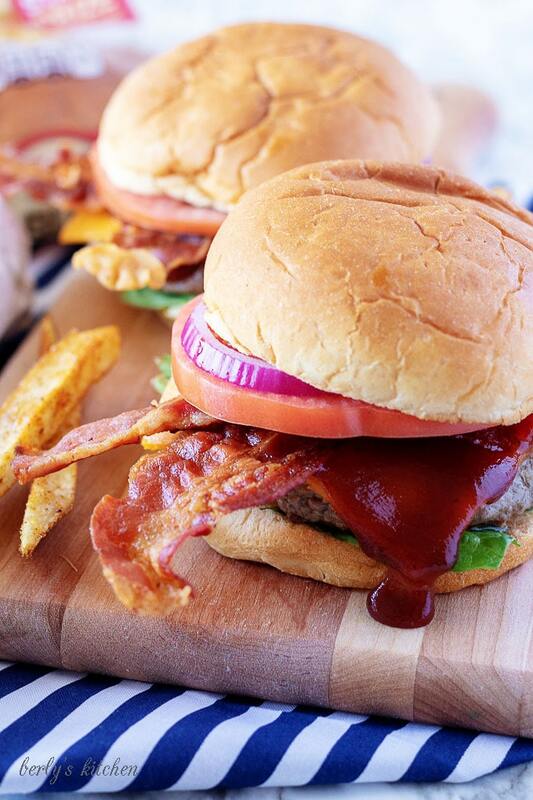 Burgers are such a summer staple, dressing them up with BBQ sauce and bacon is such a great idea and easy to do! I LOVE potato buns, these look fantastic! I love bacon and cheese on my hamburgers too! This sounds so delicious. Love a good soft bun with my burgers and this sounds perfect. Saving this for later. Can you believe I have never had potato hamburger bun before! I need to change that as these look lovely. Bacon makes everything better! Especially when combined with burger patties, cheese and bbq sauce!! These burgers would disappear within minutes around here! Delicious recipe! I need to try those buns soon. Looks so delicious. Thanks for sharing! We make burgers all the time and I’ve not added bacon or BBQ to my burgers!! SO delish! Love a good burger and those buns are the best! We buy those all the time!! Love that big puddle of BBQ sauce on the burger! I’m not a huge burger person because I often find them a little bland, but a heaping pile of BBQ sauce and I am ALL IN! Yes, yes, yes! I love burgers and these looks amazing!